For your dorm, apartment, or home, you need a light source you can depend on. Floor lamps are a pretty bright idea. Most floor lamps have tall and narrow stems, which makes them easy to tuck in any nook or cranny. Plus, many models feature more than one light bulb, so you can maximize the light in your space. In this post, we’re talking all things floor lamps. Check out ideas for staging as well as our top picks for trendy lamps in a variety of different shapes, colors, and styles. 1. Between two couches in a corner—Add light to a room without taking up lots of floor space. 2. Behind an accent chair for a reading nook—Get the best reading light when you curl up with a good book. 3. Next to a work desk for bright study light—Don’t settle for one shallow spotlight when you can illuminate your entire workspace. You can also add two matching lamps to a dark room like a basement. Position floor lamps on either end of a sofa sectional for great lighting anywhere on the couch. In large spaces, floor lamps add dimension to any room. Stage a tall lamp next to short furniture to create flow from floor to ceiling. If you have vaulted ceilings, floor lamps and long curtains can make your space feel cozy. If you have a small space, ditch the stuffy side table and lamp combination for a sleek floor lamp. Check out one of our favorite floor lamps for living rooms here. 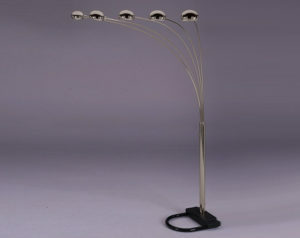 What are you looking for in a floor lamp? Do you prefer a lamp with multiple adjustable heads or a simple, stationary light? Raindrop and spider floor lamps make it easy to disperse light across a large area. You can move the arms from side to side to shine the bulbs over a desk or sitting area. Stationary lights with a single bulb shine a soft light that’s great for illuminating bedrooms and living rooms. You also need to choose a color. From metal finishes like brass and silver to standard colors like matte black and brown, you have lots of options. Consider a lamp that matches other design elements in your space like brown side tables or metallic gold decor. Browse our latest selection of floor lamps here. The more lightbulbs the better! Illuminate your room with a single floor lamp. Our top pick for multi-head floor lamps is the Crystal Spider Lamp in Pewter. It also comes in Black. The thin, modern frame has five circular heads. Adjust the arms from side to side to get the best light where you need it. Pro Tip: Use energy-saving lightbulbs to enjoy all the benefits of your floor lamp and keep your energy bills low. 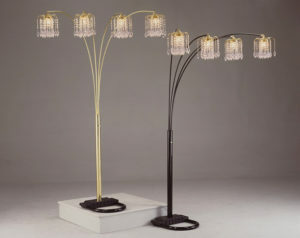 Visit your local American Freight Furniture and Mattress to shop our selection of modern floor lamps.